Fat reserves and winter fluff is ready for the season. Currently missing his left antler. Missing a tine on his right. Midday, 1st of January 2011, Kiyoko gave birth to their daughter. Virgil is overjoyed to be a father again, but concerned for their child's wellbeing due to it's prematurity. Myta (Grandson | Missing) *Picto? Scottish Accent. Warm, mid-age sounding, hint of rust. Feels most at home in the Birch Forest. Realistic Deer Base, he is a creature of instinct. Follows many of the laws of his birth-world. Influenced physically and psychology by the annual turn of the seasons. The rest is for you to interpret. Meet him, get to know him, and you'll find out what type of deer he is. Since she has antlers, Walter is going to wanna fight with her. bwaahahahaha. Hehe, I've seen you in the forest many times! *Squeal* I love the story. *Squeal* I love the story. So sad though. MAKES ME WANT TO CRYYY. I demand everyone reads it. I remember meeting him yesterday. I'm glad I caught him in a good mood, thanks for strolling around a bit with me. I remember you! You're the one who ran away right when I got there... oh, well. Sambreel will be friends with Virgil anyways. Like it or not. I shall keep mai eye open! Perhaps a bit antisocial, but I really like this way of playing. There aren't very many deer I can be more quiet and 'realistic' around. Too bad I seem to attract crowds so easily..
Is that a VCG AND a MARONA? Verycrazygirl - Sorry for responding so late. I haven't been on too much lately... Anyway. I think Virgil ran away from Sambreel a week or so ago... It was a few days before the live forest map went haywire. By the way, is that map frozen for you guys too? And if so, do you know when it'll be fixed? Thanks. Ahh, I can't remember. xD I think it was Sabah back then, was it a black and white character? ...Then I think it was a different deer with your exact set and a picto very close to yours. Also, HOW did you only have him a few days yet he's grown? Or did you say you only had him grown for a few days? I is confuzzled. Before I created Virgil, I had another deer, she was a black and white doe with antlers. -Snicker- he wasn't freaked. xD He just recognised her, and whilst she was 'sleeping', he decided to spellattack her. And Virgil only retreated when he noticed her stirring, I guess he was trying to play innocent. Hur, hey! xD Good luck with the account things! omg hi i remember you from the foggy day with everyone. Heh, I saw you in the forest and I kept following from a distance, mostly because Fei is not thrilled with stags or any other deer but She did notice that she had the same antlers, mask, and pelt on. Though she has changed those after seeing Virgil. Meh, Fei wouldn't have cared, she's a lazy bum. She would have ignored any attacks any ways so I'm not bothered. And Fei sometimes like sparing, makes her feel stronger. Hello, thar. C: Haven't seen you in a while. And heya Lex. ;3 I knew that your deer was saying hi. ^^ But Virgil, being the bum he is was stubborn. xD I'd like to thank you as a player for the company though. :3 Thankies for the fun! o.o -hides- Don't kill me. o.o -hides- Don't kill me. My cadles will Burn you. BURN!! Thank you. I'm actually also working on a pic of Luis in my own style for my DA site. I'll also post it here as a blog. 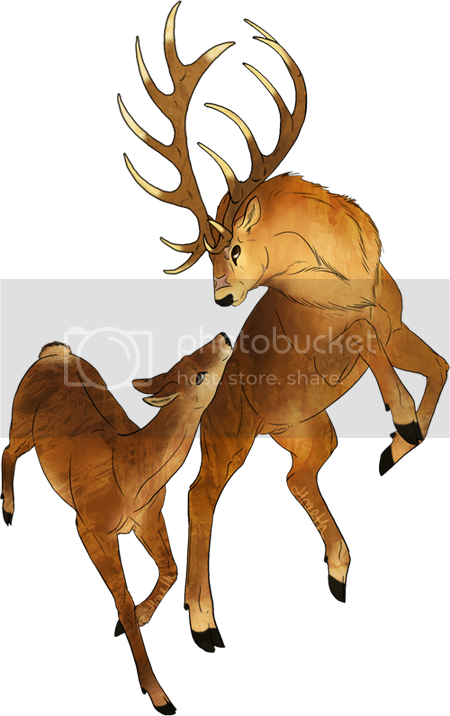 Also I've have been drawing the deers I meet in the forest as chibis.